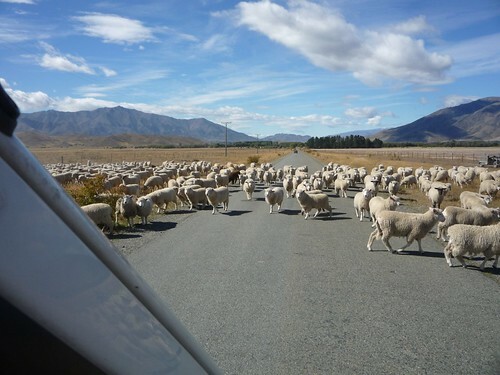 So my big dilemma in New Zealand was whether to join one of the well-established backpacker touring companies (Kiwi Xperience, Magic Bus or Stray), or really be independent and hire my own vehicle. Each had their own advantages: a tour bus would probably be cheaper and come with a ready-made set of friends (each company advertised a different type of “crowd”); hiring a vehicle would allow me to “get off the beaten track”, and have a flexible schedule. Finding someone to share a vehicle with seemed sensible, not just for cost efficiency, but to stave off any madness that might come with driving around alone for three weeks. I checked a few adverts that were in my youth hostel in Christchurch, but nothing seemed quite right. So instead I decided to prostitute myself with the poster you saw in my last blog post. Not sure whether I would get any responses or not, I went out to explore the city. Christchurch is very quaint. Wandering around the city centre, you really do wonder whether someone is having a bit of a laugh by creating this little piece of Britannia on the other side of the world. 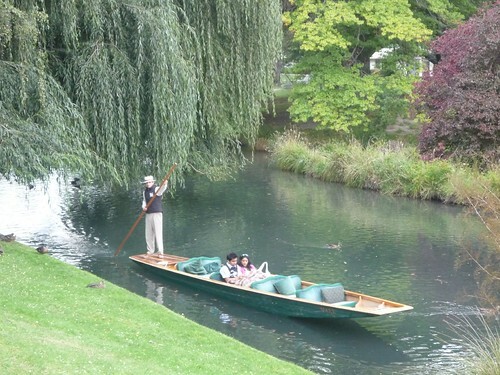 In fact it’s more English than England; everybody’s manners seem to be impeccable, wearing wool seems to be a national pastime, and the main park in the city has its trimmed hedges and colourful flower beds. It was also much colder than autumn would have been in London! Back at the hostel, I was delighted to see I had received a few messages responding to my advert. I arranged to meet the first guy that got back to me, and it was obvious Hadyn and I were going to get on famously, so we planned to get a campervan together. The next morning we picked up our new home-away-from-home, made a trip to the supermarket for important supplies (we would be cooking for ourselves in the back of the van) and ventured out into the countryside! Ideally when sharing a campervan with someone, one should be able to split the driving. The slight hiccup we encountered was that Hadyn didn’t have his driving licence with him and so all of the driving would be down to me until his licence had been couriered over from the UK. Thanks to Fraser Island, I had somewhat increased my experience since passing my test last year, but only a little. This probably explained why we went for the highest level of insurance we could on the campervan (i.e. no excess). With my driving responsibilities fixed for the next week or so, Hadyn became known as The Navigator (much to his chagrin). 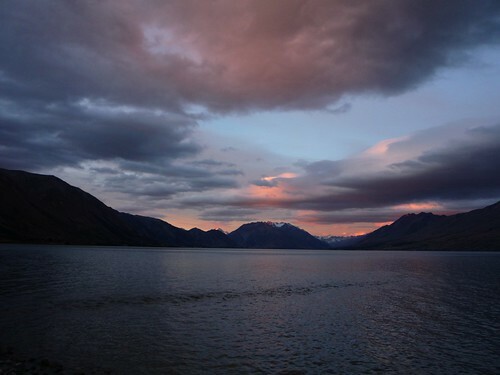 We drove that afternoon as far as could from Christchurch, southwards towards Mount Cook. 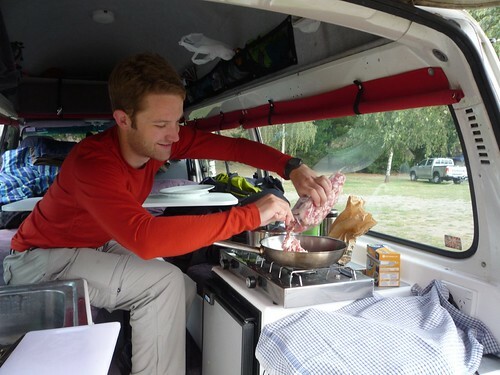 As it was getting dark, we set up camp at a camping ground and tucked into our first of many van-made meals. The sleep wasn’t too uncomfortable, and I woke to find The Navigator preparing breakfast. Perfect! 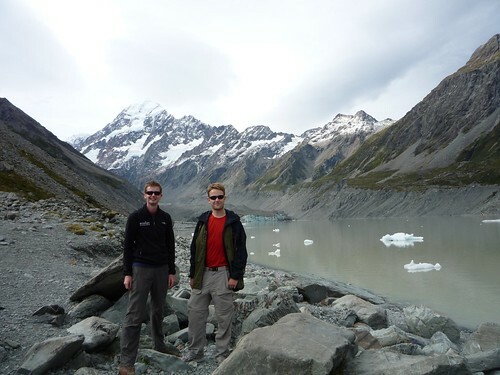 The summit of Mount Cook is beyond the reach of the non-mountaineer, but we made use of the freedom our campervan gave us to drive to Mount Cook village (at the end of a 50km dead-end road) and go for a walk in the nearby valleys. Once again we were stuck by how friendly everybody was; nodding and saying “Hello” to everybody we passed on the track was virtually compulsory. 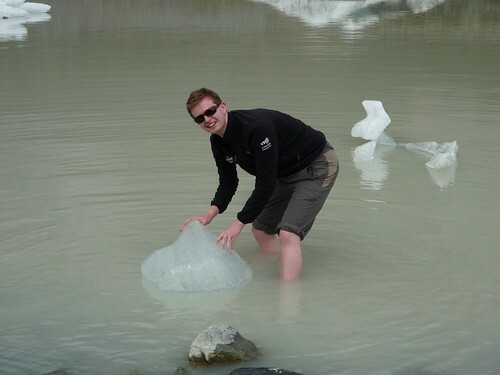 When we reached a glacial lake, I wasn’t quite convinced that the large lumps of ice were real (since it seemed pretty warm), so I went in for a paddle to check. To water was exceptionally cold (just above 0C would sound about right), but of course I put on a brave face. 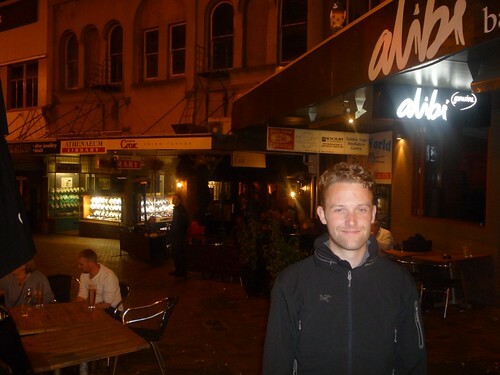 That night we had our first of many nights of dubious legality by the side of the road. It didn’t seem necessary to go to a campsite every night as you don’t really need a warm shower and electricity everywhere you go. As we settled in for a beautiful sunset by the side of a deserted lake, I did lock the doors from the inside, lest we be visited in the middle of the night by an angry local farmer brandishing a shotgun! The next morning we drove past four cars (of which two were police cars); where was everybody?? And to really rub it in, we were held up by a farmer and his flock for a few minutes. Later, we arrived in Oamaru, a charming town on the south-eastern coast of South Island (our first signs of civilisation for a couple of days). We asked the friendly staff at the place we ate lunch, what we could do in the town. "Ummm, well you could go to the cinema." Even though this part of the country is stunning, we were beginning to realise that there’s not much to do around here. 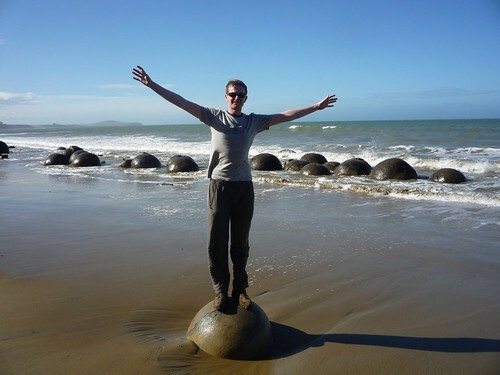 We eventually managed to tease out a recommendation to see the Moeraki Boulders, strange rocks that are almost perfectly spherical. That evening, we returned to civilisation (i.e. a campsite), if only to make use of the hot showers. Hadyn had been avoiding the alcohol since we met, but tonight would be his first night off the wagon, so we ventured into Dunedin city centre in a bus from the campsite to get merry. 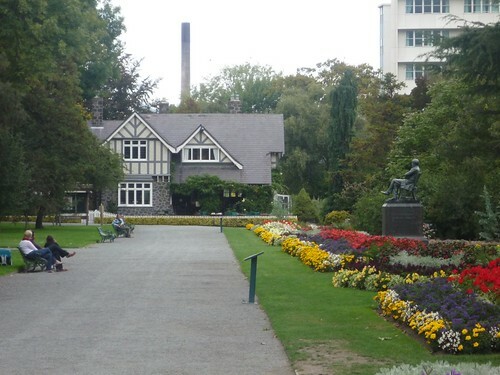 Dunedin is the student capital of South Island, so has a great bar scene. (We heard that Freshers’ week a few weeks previously had got dramatically out of hand for the nth year in a row). It is also the start of a strip of New Zealand which has a predominantly Scottish, rather than English heritage. Does my travelling companion look drunk in this photo of the end of the night? 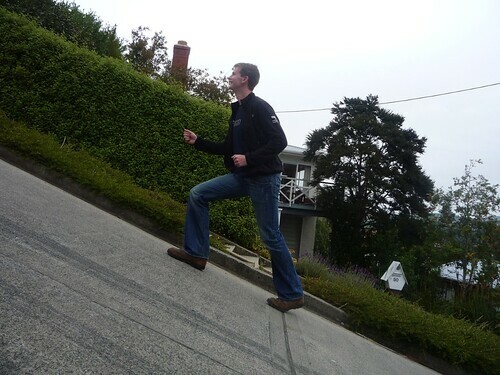 Dunedin also has the strange claim to fame of having the steepest street in the world. We decided against driving the van up Baldwin Street in the morning and instead planned a run to the top instead. Halfway up, we decided against this also. The next "Scottish-themed" town on our route was Invercargill, the most southerly city in the world. 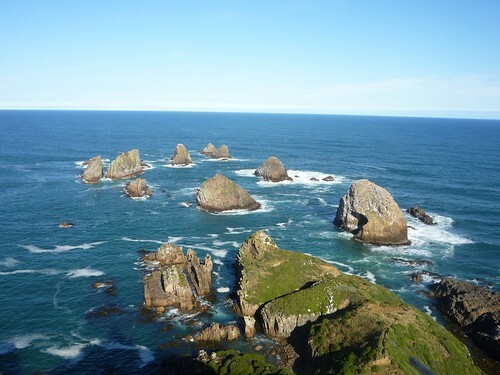 On the way, we stopped off to admire some of the marine wildlife of Nugget Point. There are actually hundreds of seals in the photo below. 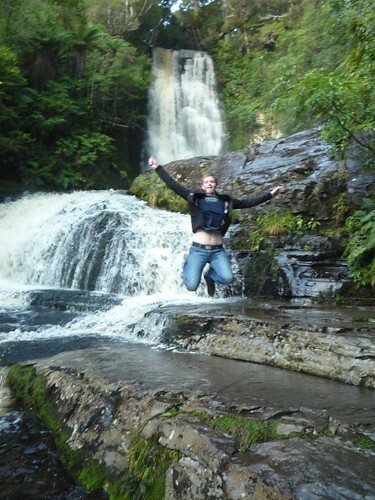 Of course, caves have their dangers, but here I demonstrate how to deal with a fall from grace in style. If you can’t see this video or you’re reading this blog on Facebook, you will need to go to http://www.facebook.com/video/video.php?v=559757546455 to see the video. Exhilarated by our random trips into the middle of nowhere, we later arrived in Queenstown, possibly the exhilaration capital of the world. 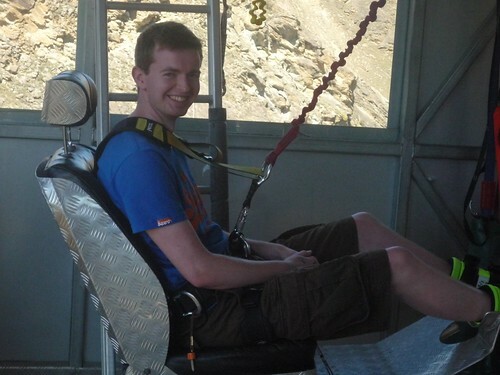 I was determined to do a bungee jump, and this was the place to do it. Oddly enough I didn’t really feel particularly worried about doing one; I’ve never had an issue with heights and a bungee seemed like it would be a good chuckle. A.J. Hackett were the people who brought bungee jumping into the mainstream. 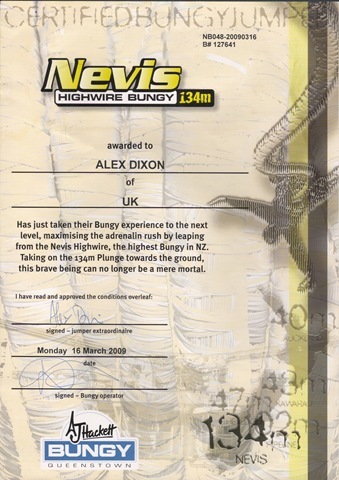 They have three different jumps in an around Queenstown but rather than spend my time working up to the biggest jump, I thought I would just sign up for the biggest straight away and see what all of the fuss is about. 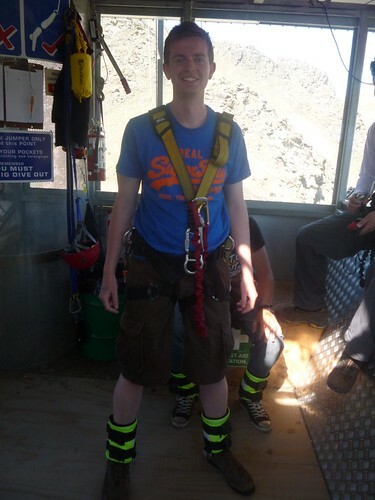 The Nevis Bungee is done from a suspended platform that is 134m (440ft) above the Nevis River about 30km outside of the town. Coach transport was arranged, and as we travelled to the bungee site, no one was talking and the driver was playing death metal rock music at full volume. Our party was only then starting to realise when we were getting ourselves in for; you could smell the adrenaline in the air. Our group was winched over to the bungee platform suspended over the middle of the canyon, accompanied by the occasional sound of screaming and a body-shaped object falling over the side of our destination. Once we had arrived, our harnesses were checked and each had to wait their turn. This gave us an opportunity to inspect the rope (really just lots of rubber bands bundled together) and admire the jumping technique of those before us (dive, don’t drop). The whole time I am holding my (self-delusional??) smile; I’m still really quite excited. Once we’re happy to go, I’m instructed to shuffle (my feet are tied together after all) onto the “meat slab”, essentially the modern day equivalent of walking the plank. “Don’t look down” is the advice we’re given. And I don’t; and I’m still smiling. If you can’t see this video or you’re reading this blog on Facebook, you will need to go to http://www.facebook.com/video/video.php?v=559720425845 to see the video. It was at that very moment, as I dived off (or toppled off?) the meat slab, that I realised how much I had been kidding myself the past few hours. How actually it’s completely ridiculous to jump into the void, with the ground so far away. But hang on, the ground is getting closer. Is this going to work?? The wind is sweeping past my body and there are no signs of slowing down. Besides the wind, it’s also quiet. Having been pumped up with loud music for the past few hours, it now seems eerily quiet and I feel strangely alone. Am I going to die alone?? Needless to say, I did slow down (amazing this modern technology) and I bounced up and down a few times before unhooking my feet and returning gracefully back up to the platform. For an 8½ second experience it did seem to last an awfully long time, and once I got back to the campervan, I tried to sleep it off, but the experience echoed in my head over and over again. For several days afterwards, the experience would spontaneously recur like a scratched CD, and even now my stomach plummets whenever I watch the video, (I can’t imagine what my parents think). Would I do it again? Possibly not. But that’s the point of a once-in-a-lifetime experience.